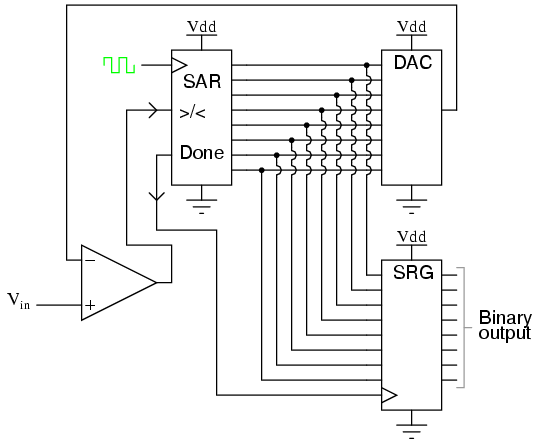 ANALOG TO DIGITAL CONVERTER - how ADC works? An analog to digital converter (ADC) is an electronic device which converts varying analog signals into digital signals so that they can easily be read by the digital devices. it have many applications in electronics projects. ADC converts the quantities of real world phenomenon in to digital language which is used in control systems, data computing, data transmission and information processing. Figure below shows the input/ output relationship of an ADC. 2 ADC PROCESS and How ADC works ? Usually transducers are also used to convert the input analog variables in the form of currents or voltages. Basically the digital numbers used here are binary i,e ‘0’ and ‘1’. The ‘0’ indicates the ‘off’ state and ‘1’ represents the ‘on’ state. Hence all the analog values are converted into digital binary values by an ADC.For example, if we have to install an alarm in our house or at some facility, whose function is to set off in case of fire or overheating. Our whole alarm system will be electronic but the temperature sensor will give analog values at the output after sensing the temperature. Therefore to convert the varying values of temperature in digital or discrete values, we have to use an analog to digital converter. ADC PROCESS and How ADC works ? 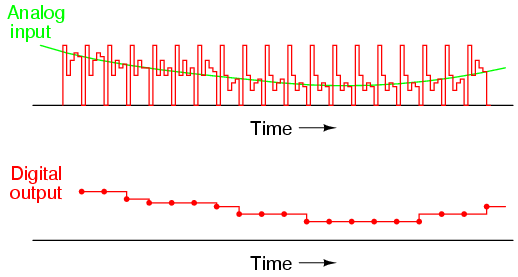 An analog signal continuously changes with time, in order to measure the signal we have to keep it steady for a short duration so that it can be sampled. We could measure the signal repeatedly and very fast, and then find out the right time scale. or we could measure the signal at different timings and then average it. Or preferably we can hold the signal for a specific duration and then digitize the signal and sample the value. This is done by a sample and hold circuit. For, at least the time required for digitization, it keeps the value stable. Figure shows the circuit for sampling and holding of a signal. We keep the switch normally open, and when we want to find a measurement, we close the switch momentarily. On the output of (S/H), a certain voltage level is present. We assign a numerical value to it. The nearest value, in correspondence with the amplitude of sampling and holding signal, is searched. And this value cannot be just any value, it should be from a limited set of possible values. It depends on the range of the quantizer and the range in given in a power of 2 i,e 2n (28 = 256, 210=1024 etc). The values achieved after the quantization and encoding process cannot be said to be thoroughly accurate. These are only the approximations of the real world values. The accuracy of the quantizer highly depends on the resolution of the qunatizer, greater the resolution, more accurate the values will be.The ADC resolution is limited by a number of constraints, out of which, time is a major issue. If the set of possible values, from which the closest value is to be searched, is greater, then it will surely take more time. But to accelerate this process, more techniques have been developed. The following table shows the performance of different ‘n’ bit ADCs. If the number of bits is greater, then the frequency is lesser and time consumed is also greater. On the other hand, the error minimizes as the number of bits is increased. The maximum sampling rates have also been indicated in the table. Flash Analog to Digital converter. Dual slope Analog to Digital converter. Successive Approximation Analog to Digital Converter. Vref is the reference voltage; if the analog value at the input becomes greater than the reference voltage then the comparator output will be high.Flash converter is the most efficient of all the converters in terms of speed. But the number of comparators increases as the number of bits increases. We would require 7 comparators for 3-bit and 15 comparators for 4-bits. This is the weakness of flash ADC. But a flash converter can produce a non-linear output which is an additional advantage. The voltage divider network consists of equal-value resistors which provide a proportional response. But for special applications, the value of the resistors can be changed which will give a non linear response. A dual slope integrator first integrates and then disintegrates a voltage signal. It integrates an unknown voltage for a fixed time and disintegrates for variable time using a reference voltage. Figure 5 shows the graph of dual slope integration. For example, if we want to obtain a resolution of 10 bits, we would integrate for 210= 1024 cycles and then de-integrate for 1024 cycles. By increasing the number of clock cycles, we can obtain more resolution. So far we have discussed the three most common types of Analog to digital converters but there are other converters also such as sigma delta, digital ramp adc, tracking adc etc which are also widely used converters. Why does some ADC and DACs need a externa lpower supply and some dont, What’s the difference?